Up on the Tioga Pass, Dana Village, Bennettville and the abandoned Golden Crown Mine tell part of the story of the 1890s gold rush in the Sierra Nevada. Mining in California, okay. Mining at 11,000 feet in the Sierra Nevada, and staying there all winter? Great history, geography, and explanation that every U.S. history student should know, about gold rushes, about boom towns, about mining entrepreneurs and investors, about failed enterprises and about the aftermath. Sitting on the crest of the Sierra Nevada, Tioga Pass is a gateway to Yosemite’s past. In 1880, a gold and silver rush erupted here, and miners flocked to Tioga Hill in droves. Today, the ghosts of these miners work can be seen in the stone walls of Dana Village, rusty machinery at Bennettville, and the log cabins of the Golden Crown Mine. Even today’s popular Tioga Road was once a simple wagon road built to access the wealth of minerals that were never found. It’s another great production by Steven Bumgardner, featuring two National Park Service rangers, Yenyen Chan and Greg Stock. 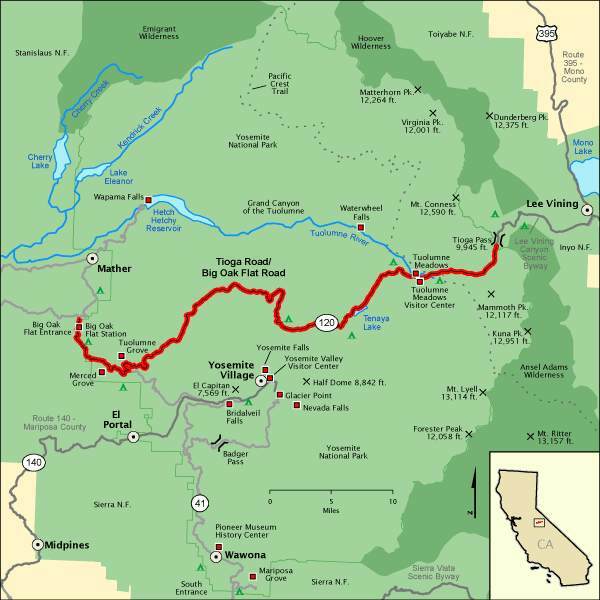 Map showing how to get to Tioga Pass in Yosemite National Park (at the eastern end of the red line). Map from Undiscovered-Yosemite.com. This entry was posted on Tuesday, January 13th, 2015 at 12:28 am and is filed under Geography - Physical, geology, History, Mining and Mining Law, National Parks, Travel, Yosemite. You can follow any responses to this entry through the RSS 2.0 feed. You can leave a response, or trackback from your own site. Now I have more places I need to check out next time I go to Yosemite.